Outokumpu, a global leader in the production of zero-waste stainless steel and recyclable advanced materials, has been solely focused on recycling stainless steel at its Tornio plant for more than 17 years now. All Outokumpu’s products are made from 70 to 90 per cent recycled materials and are fully recyclable at the end of their life cycles. The group’s main business is now based on recycling steel and its content stands the highest on the market at 87 per cent. The history of Outokumpu tracks back to a rich copper ore deposit discovered in Eastern Finland in 1910. Outokumpu as it is known today was formed through the acquisition of Avesta Sheffield in 2001 and Inoxum, the stainless-steel arm of Thyssen Krupp, in 2012. Over the years, Outokumpu has evolved from a mining and multi-metal company to the global leader in stainless steel. The company’s Tornio plant is now described as the world’s most integrated stainless steel plant. According to Outokumpu, the Tornio plant’s industrial symbiosis is estimated at 200 million euros a year. In order to enhance efficiency, the company minimizes the initial use of virgin materials in its production as well as reduces the waste sent to landfills. It is not only an environment-friendly model but also very cost effective. – Outokumpu’s business is based on recycling. Our main raw material is recycled steel which we get and import from all part of Europe to our plant in Tornio, Finland. We melt it in our melting shop by electricity, add many alloying elements like ferrochrome and produce stainless steel according to customer orders, said Outokumpu’s Vice President of Sustainability and Environment Juha Ylimaunu. According to Outokumpu, stainless steel is everywhere, and the demand is increasing every day. The recyclable stainless steel is used, among other things, in energy, chemical industry, building, transportation, heating and cooling, oil and gas industries, forest industry as well as making home appliances. These products are sold on both domestic and foreign markets. Simply put, there cannot be steel production without the use of by-products. – We make business on steel scrap, melt it and make excellent products from it all over the world. 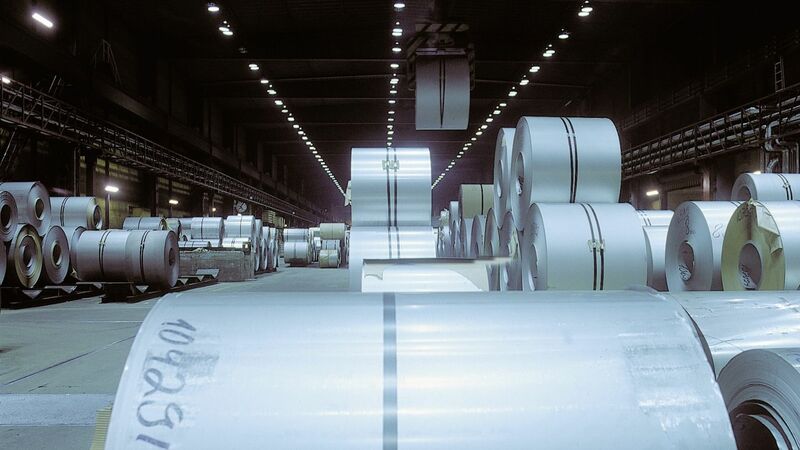 From our end-products some 95% will be exported outside Finland, said Ylimaunu, adding that “recycling of steel is the best business in making stainless steel”. The other way [of doing it], e.g., using blast furnace route [virgin iron ore] is more costly, requires more energy and causes much more emissions to the air and environment. The reprocessing of by-products is integral to Outokumpu’s operations. For instance, on every working day, about 60 to 80 trucks of slug have to be treated. The metals are afterwards recovered, and slag products crushed and produced according to quality standards. In Northern Finland, slag by-products have been used for road construction purposes for many years since the technical properties of slug are better than in natural stones. For Outokumpu, it is necessary to have industrial and commercial partners, even though this should not be considered a core business of metal producers. Still, Outokumpu in its endeavor to support circular economy and sustainability by curtailing utilization of nature’s virgin raw materials through recycling, contracts other companies. – Some subcontractors are treating recycled steel for melting processes, others are treating our by-material flows like slag into new customer products [road stone or aggregates, asphalts etc], said Ylimaunu. Examples of materials processed by Outokumpu’s contractors include recovered steel, recovered fine lime, CE-certified slag products, recovered ferrochrome, refractory cross and refractory mass. One of the companies contracted by Outokumpu is the Tornio-based Tapojärvi Oy, a company which offers services to steel mills and mines. Tapojärvi, which boasts of a cutting-edge knowhow and technology in recycling by-products, offers a wide-array of services to heavy industries. – Tapojärvi is engaged in recycling of Outokumpu’s used refractory bricks. Used refractory bricks is turned into refractory cross and refractory masses which are used again at the stainless steel producing process, replacing and saving virgin natural materials and minerals, said Outokumpu Chief Operating Officer Henri Pilventö. As explained by Pilventö, Tapojärvi is also involved in valorising by-products (slag) from stainless steel and ferrochromium production. The valorisation plant for ferrochrome slag turns the ferrochrome factory’s by-products into valuable products without disposable waste. Through concentration of ferrochrome slag, the company is able to separate and return significant amounts of ferrochrome back to the ferrochrome factory’s production, and the residual material is used to produce first class rock material. Similarly, by concentrating slag, the company is able to separate a significant amount of valuable metals and return them to the steel factory. This process is very cost effective, since waste taxes are avoided and, most importantly, slug is recycled to high class rock material, hence reducing the need for virgin raw materials. – Addition of valorised products to metals translates into first class infrastructure building materials as artificial aggregates. These aggregates have been used successively for over 15 years in Northern Finland. Slaked lime is also separated and re-used in stainless steel production, said Pilventö. To what constitute the future business opportunities for Outokumpu’s operations in furthering its circular economic goals, Ylimaunu’s said there is a need to make processes, such as making the by-product flow, more efficient and there is also much room for introducing new applications. Outokumpu, a part of European joint effort to gear up competitiveness of steel industry, has just received the Materialica Award 2017 on October 27 at the eMove360 materials and electromobility trade fair in Munich.